Like most busy moms I don’t always want to entertain my children with screen time, but I also don’t always have time to play with them. The Elephants Never Forget Memory Matching Game (CD-3110) by Carson-Dellosa is one way to keep my twin preschoolers busy while I get things done. I bought this game when my twins turned three. I was specifically looking for an educational game that was not too expensive. I purchased this game for approximately $10 at an upscale teacher supply store. You could probably find it for a lower price if you look hard enough. The game includes 36 game cards shaped like cute cartoon elephants in two colors (blue and purple), a two-sided glossy game mat, clear instructions, and a sturdy box. The box says there are three ways to play the game, but when you look into the instructions you’ll discover at least four ways to play. My energetic four-year-olds have invented many unintended play formats, too. 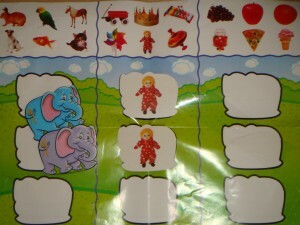 Match – Look at the pictures on each elephant game card and find the matching picture on one side of the game mat. 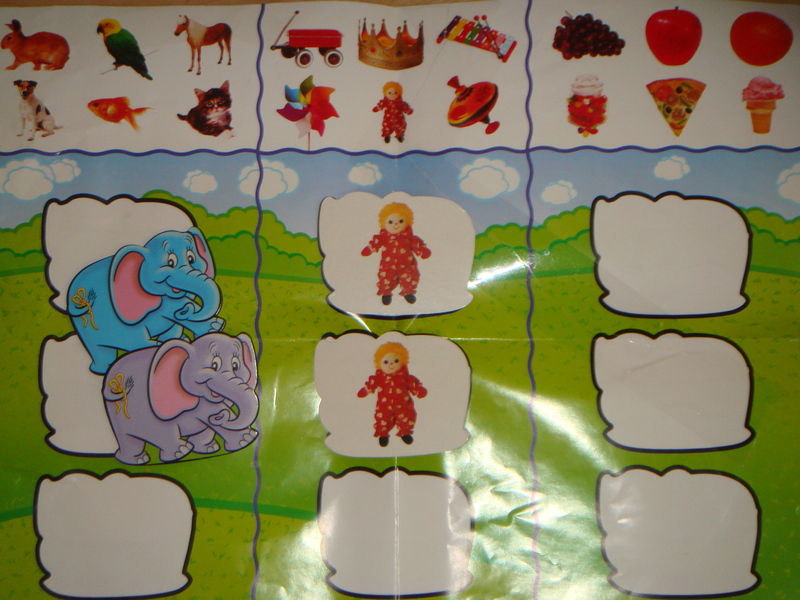 Sort – Look at the pictures on each elephant game card and decide if it is a food, toy, or animal. Place the card in the appropriate column on the other side of the game mat. 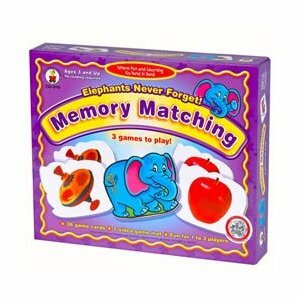 First Step Memory Match – Each player gets some blue elephant cards. The purple elephant cards are put in an array on the game mat or on a table. The players take turns flipping over a purple elephant card. If they find a match for one of their blue cards, they make the pair and take another turn. Memory Match – This game is similar to classic concentration. All of the elephant game cards are put in an array on a table. The players take turns flipping over one blue card and one purple card. If they find a match they make a pair and take another turn. Once your children have mastered the Elephant Memory Matching game you might want to try similar games from Carson-Dellosa, like the Who’s My Baby Memory Matching Game which pairs full-grown animals with their babies. Pros: I like that this game can be played individually or jointly (up to 3 players). Initially it takes a while to show the children how to play the game, but soon they can be left on their own to play and explore. The colorful pictures on each game card and on the game mat are attractive to kids. The game is a fun way to practice important math-related skills like matching and sorting. Memory games are a great way to expand attention span. Cons: The game mat is not really durable for the age group this game is marketed to. It is just glossy paper that tears easily. I’m hoping to laminate ours, but then it won’t fit into the game box, so that presents a new challenge. The game cards are sturdier, but may be easily lost under furniture or a rug. In all this is a fun, educational game that is suitable for preschool children to play on their own or with an older sibling or parent. Given the affordable price, you really can’t go wrong with this game.